Introduction and Background: The United States has a higher rate of unintended pregnancies than many other developed countries despite the availability of effective contraception. 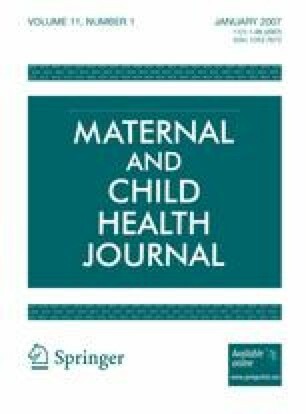 Using Azjen's Theory of Planned Behavior and Luker's Theory of Contraceptive Risk Taking this qualitative study explores the reasons for the high rate of unintended pregnancy among low income women in Georgia. Methods: Six focus groups (N=39) were conducted at county health department clinics. Women were recruited at the clinics to participate in a discussion of Pregnancy and Motherhood. All English or Spanish speaking women between the ages of 18 and 49 were eligible for participation. Results: Three dimensions of pregnancy planning emerged-the decision to have a child, taking specific behaviors to increase the likelihood of conception, and making plans to care for a child. Planned pregnancies may occur when a couple or a woman decides that they are ready to have a child, but also occur in less stable situations that pose risks for the family and the child. Unplanned pregnancies may be welcomed or be unwanted depending on the circumstances. Women perceive advantages and disadvantages to planned and unplanned pregnancies. Discussion: There are major differences between the definition and values of planned and unplanned pregnancies promoted by public health practitioners and those of the women in our study. This suggests the need for research on the circumstances in which pregnancies occur, as well as targeted interventions and policies that help women and men define and achieve the circumstances in which they would like to bear and rear children. This project was made possible in part by a grant from Pew Charitable Trusts. The authors would like to acknowledge Ms. Jacqueline Lewis and Ms. Carla Galindo, MPH for their roles in facilitating the focus groups and analyzing focus group data and Ms. Emily Kahn, MPH at the Georgia Department of Human Resources/Division of Public Health for being our project sponsor.